Join CES at the 67th Annual Design and Construction Conference & Trade Show on Thursday, March 21. There’s only two weeks left to register! Below are some of the conference highlights that you don’t want to miss. 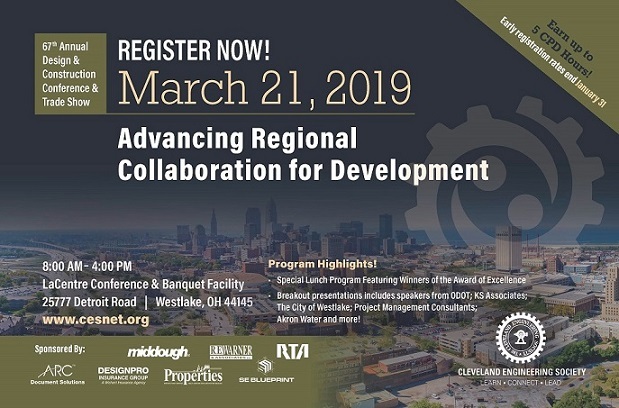 Attend four breakout sessions featuring speakers from the Cleveland Indians, ODOT, KS Associates, Cleveland Metroparks and more! See the attached brochure for more program details. To register online select “nonmember individual registration” and enter promo code ASCE-67DC to get $100 off. Contact CES with questions about the conference at 216-361-3100, ext. 2.